Use Data Sharing to wirelessly view, collect, analyze, and share experimental data. Stream to mobile devices such as Chromebook™ notebooks, iPad®, and Android™ tablets for hands-on, collaborative learning with individualized accountability. Collect data from one or more of our extensive selection of sensors. Wirelessly view and control data collection from each student’s mobile device and stream an individual copy of the data for analysis. Each student receives an individual copy of the data for analysis. Students annotate the data, perform curve fits, and make statistical calculations to build evidence of understanding. Students share their data and analysis with their instructor or take it home for further analysis on their mobile device. Students enhance their lab reports and presentations with data and graphs. Students use a Data Sharing app to wirelessly start data collection. Experiment data is streamed from the Data Sharing source to each students’ Data Sharing app. Each lab group member performs an individual analysis on their Data Sharing app. Students take their data and analysis home on the Data Sharing app for further analysis and lab reports. 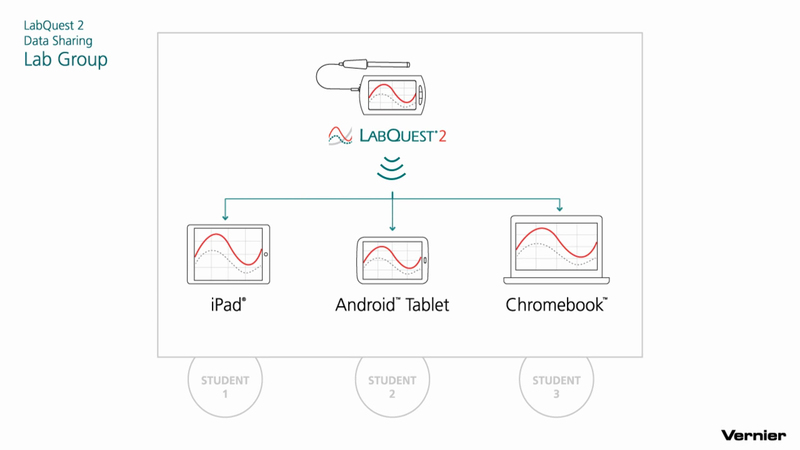 Enable LabQuest 2 or Logger Pro as Data Sharing sources to stream Vernier sensor data over a network to Data Sharing apps. Graphical Analysis app and Vernier Data Share web app enable students to view, control, analyze, and annotate sensor data from a Data Sharing source. This award recognizes the best instructional solution for science and health curricula and content for students in the PK-12 or postsecondary market. See all the wireless solutions for hands-on science. View tutorials and resources for the Connected Science System.